Just how good is Aleksander (Sasha) Barkov, Florida’s star centreman and recently named All-Star? His teammate, veteran defenceman Keith Yandle, is happy to offer up his take. Just how good is Aleksander (Sasha) Barkov, Florida’s star centreman? His teammate, veteran defenceman Keith Yandle, is happy to offer up his take. Selected second overall by the Panthers in 2013, Barkov, now in his fifth NHL season, is on pace to establish several personal-best offensive numbers, including topping the 59 points he tallied in 2015-16. 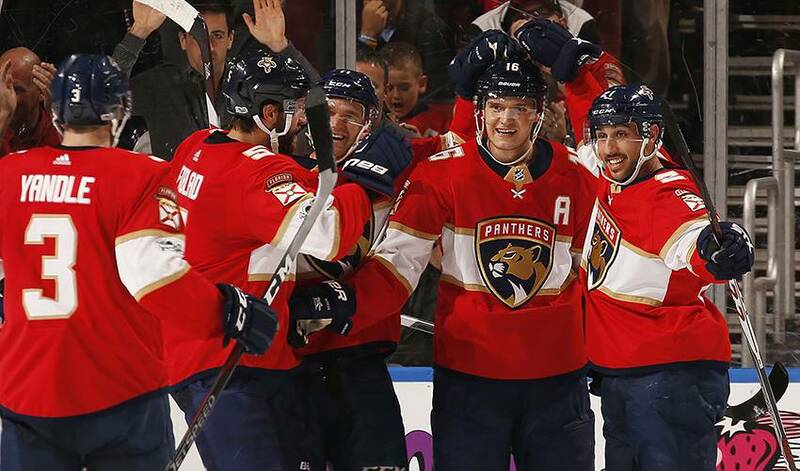 The 22-year-old son of former Russian hockey player Aleksander Barkov, Sr. has established himself as a genuine major league talent, showcasing poise, playmaking ability and a penchant for putting the puck in the net. In his last four games, Barkov has recorded three goals and seven points, including a three-point night on January 9 against St. Louis, a 7-4 road win for the Panthers. He earned First Star honours for his performance. According to Yandle, the player who’s on pace to score 28 goals this season would gladly give up a shot to set up a teammate. Off the ice, the soft-spoken Barkov, who leads the league with four shorthanded goals in 2017-18, has shown a flair for dishing out some memorable quips. Barkov also happens to be one of the game’s top two-way centres, equally adept on both the power-play and penalty kill. But Yandle sees even better days ahead for the player who’s closing in on his 300th NHL game. Something the hockey world will get to see when Barkov skates in his first NHL All-Star Game in Tampa January 28. As it turns out, No. 16 is a family tradition for Sasha Barkov, who fell in love with hockey the first time he started skating. Learn more about the Finnish forward in his Player Q&A. Keith Yandle, an ironman in his own right, marvels at his Florida Panthers teammate Jaromir Jagr's on-ice accomplishments, and meticulous preparations before each game.